While paying homage to past Bentley greats, the brief for the new Mulsanne’s design and engineering teams was to provide a Bentley that represents the pinnacle of British luxury motoring. The new Mulsanne, designed and engineered at Crewe from the ground-up, reaffirms the marque’s intent to provide a new flagship Bentley with refined performance, unparalleled levels of interior luxury and coach building skills to the fore. 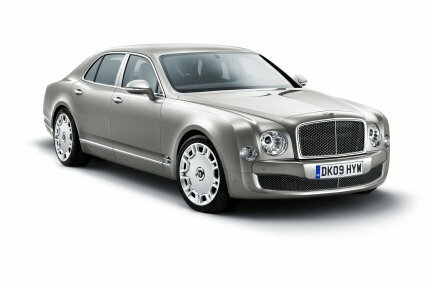 The return of the Mulsanne name underlines Bentley’s sporting heritage and passion for power and speed. Nothing reflects that prowess better than the legendary Le Mans 24 Hours race. Bentley has enjoyed success on six occasions at Le Mans, where its powerful and reliable race cars have thundered down the long straight into the famous Mulsanne corner, from which the new model takes its name. 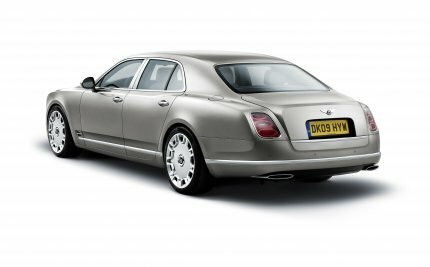 The design of the new Bentley Mulsanne is a unique fusion of sportiness, coachbuilt elegance and solidity. Echoing the Bentley S -Type of the 1950s, the Mulsanne features a bold frontal design dominated by the traditional Bentley matrix grille and highly prominent, classic round inner headlamps with chrome surrounds, flanked by two, smaller outboard lamp clusters, all featuring the latest in lighting technology. The iconic ‘Flying B’ retractable radiator mascot is available as an option. The long bonnet, short front overhang and long rear overhang help to convey a sense of power and movement, reinforced by 'muscular haunches' and sharply sculptured lines which flow gracefully from the front guards to the rear. Uniquely designed 20-inch (and optional 21-inch) wheels reinforce the Mulsanne’s powerful, sporting stance. The body is produced in a new manufacturing facility at Bentley’s headquarters in Crewe where traditional metalworking skills, developed over six decades, are still used extensively during the nine-week build process. It is the very opposite of volume-production car-building… but the very epitome of Bentley. The rear screen, for example is fully enveloped by the coachwork. This provides a flowing, flawless line to the rear of the car, complementing the exquisitely formed D-pillars – whose complex curves can only be provided by skilled coach-builders. The complex form of the aluminium front guards, impossible to achieve with normal pressing techniques, is designed using superforming, a technology usually reserved for the aerospace industry. This also makes the guards lighter, stiffer and provides superb surface definition. New construction techniques meant the designers could also incorporate details such as the ‘floating’ elliptical LED tail lights, which uniquely echo the shape of the exhaust tailpipes. To accentuate the beauty of the bodywork, the Mulsanne features ‘brightware’ exclusively in polished stainless steel, including sill treadplates and matrix grilles. Bentley is the only manufacturer in the world to do this. The door handles incorporate the traditional Bentley ‘knurling’ to their inboard surface for enhanced grip, reflecting the company’s typical attention to detail, while .the sporting character of the Mulsanne is reinforced by front guard vents and wide oval tailpipe finishers. Bentley customers have a world of infinite choice when commissioning their cars. There are over 100 paint colours in the range that include everything from unusual heritage colours, special satin and pearlescent finishes and duo-tone combinations. But the choice does not end there. Through the bespoke world of Bentley Mulliner, unique colours can exactly match a customer’s vision and taste. The latest in-car technologies are discreetly placed within the Mulsanne’s sumptuous interior. A multimedia system with 60GB hard disc drives satellite navigation, audio/video, personal data, telephone and Bluetooth® connectivity. The upper dashboard houses an 8-inch multimedia screen, positioned unobtrusively behind an electrically operated veneered door, while below sits a stylish, leather-lined media player stowage drawer with connectors for iPod, USB, Mini USB and 3.5mm aux. A state-of-the-art 14-speaker audio system with Digital Signal Processing (DSP) and 6-CD autochanger is provided as standard while the Naim for Bentley premium audio system may be specified as an option. This forging of two British luxury brands provides customers with the world’s most powerful production in-car amplifier with 2,200 Watts, eight dedicated DSP modes and 20 custom-made speakers, delivering an unparalleled sound quality. A personalised keyless entry system allows multiple pre-programmed configurations and automatically sets radio stations, phone book, seat (including ventilation and massage modes, both front and rear), steering column and seatbelt settings and even the electrically operated rear-seat blinds for side and rear windows. The keyless system operates with the chrome door handles which incorporate touch points to initiate communication with the key for verification and entry. The Mulsanne also features keyless start, having a stop/start button on the centre console. The Bentley interior design team has continued to develop and evolve the luxurious interiors for which their cars are renowned, based on a large-scale, research programme to identify the classic signature features that have defined Bentleys from the 1920s to the present day. Armed with this invaluable resource, the Mulsanne’s design team set itself highly challenging targets for key interior characteristics such as material design, smell, colour harmony and handcrafting. Similar targets were set for the operational refinement and robustness of all control mechanisms. The result is a hand-crafted interior that fully reflects traditional Bentley values, executed to the highest possible standards. The use of wood and leather hides has increased significantly to provide an even more refined and luxurious cabin. While classic design features such as bulls-eye air vents (now also fitted in the rear compartment), high-quality mirror-matched wood veneers, leather hides and hand-finished stainless steel are retained, they are mixed with new touches such as beautiful ‘glass’ switches. The entire cabin is encased within a ‘ring of wood’ waistrail with an unbroken panel of wood gracing the Bentley Mulsanne’s dashboard. Inverted dial needles within the instrument cluster are evocative of early Bentleys while the entire dashboard and console design is a subtle reminder of the Bentley wings motif. Customers may select from an extensive range of premium quality veneers, unbleached for a natural appearance, and two marquetry options: picture frame and contemporary crossbanding. True to the Bentley ethos, customers may also select from a virtually unlimited palette of leather hides, including 24 ‘standard’ colours, of which three are new for Bentley. This unrivalled choice of veneers, leather hides and paint colours ensures that the needs of all customers can be matched perfectly. Following detailed customer feedback, a traditional tanning process has been re-instated to match the rich, worn leather smell that is so evocative of vintage Bentleys. Only a very few hide suppliers worldwide have the capability to do this. 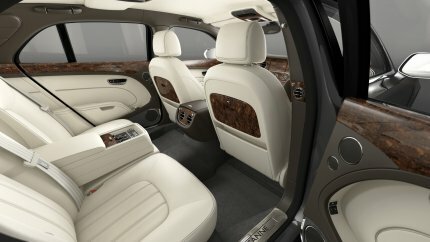 The carpet of the Mulsanne is unique to Bentley, its increased fibre depth, density and feel enhancing cabin quality. It is available in a range of colours to complement each individual hide. Pure wool, deep pile Wilton-weave over mats can add a further touch of comfort and luxury. These exquisite materials are fashioned by craftsmen and women with up to 40 years’ experience. Each steering wheel, for example, can take 15 hours to hand-stitch while stainless steel brightware gleams so perfectly thanks to an intensive 10-hour finishing process. A wood veneer takes five weeks to turn from a rough root ball into a full set of mirror-matched, fine-polished leaves. While other powertrain configurations were considered early on in the project, it soon became clear that these targets could best be achieved with a totally revised version of the 6¾ litre V8 engine – the very configuration that had been used so successfully in the past. However for the new Bentley Mulsanne, all the major building blocks of the engine would be comprehensively re-engineered to integrate the very latest technologies. To achieve a significant reduction in fuel consumption and CO2 emissions, the Mulsanne V8 sees the introduction of two new control systems: cam phasing and, a first for the ultra-luxury sector, variable displacement. The pioneering use of these two technologies in combination allows the Mulsanne’s engine management system not only to adjust the V8’s breathing for improved engine idle quality and torque delivery, but also to close the valves of four of the eight cylinders for maximum fuel economy when cruising. New light weight componentry including pistons, connecting rods and forged crankshaft reduce reciprocating mass and internal friction for improved engine response. In the new Mulsanne, the 6¾ litre V8 develops 377 kW while the massive torque (1,020 Nm) is now delivered even earlier at 1,750 rev/min. This dramatic improvement in torque delivery from just above idle and right across the rev range ensures that with a mere tap of the accelerator the driver is immediately rewarded with that characteristic deep, muffled V8 burble and phenomenal acceleration. These new technologies are complemented by the new eight-speed automatic transmission which, for the first time on a flagship Bentley, comes with steering-wheel mounted paddleshift. Overall, CO2 emissions and fuel consumption are reduced by more than 15 per cent, in line with Bentley’s environmental commitment. Prodigious power and torque are complemented by an all-new chassis, unique to the new Mulsanne. Both lighter and stiffer than previous flagship Bentleys, the new chassis benefits both ride and handling. A new Drive Dynamics Control system, operated by a rotary switch mounted next to the gearshift selector, can be used to choose from three standard modes – Bentley, Sport and Comfort – offering precise calibration of suspension and steering control systems. A fourth mode, ‘Custom’, allows the driver to select bespoke settings via the multimedia system to ‘tune’ the Mulsanne to a preferred driving style. A new air suspension system with Continuous Damping Control (CDC) provides an even more refined and comfortable ride at lower speeds, yet can reduce the Mulsanne’s ride height automatically at high speeds to reduce lift and improve aerodynamic stability. With 20 inch alloy wheels and 265/45 ZR 20 tyres as standard, dynamic handling is assured. Customers may also opt for 21 inch wheels, available in two styles, fitted with 265/40 ZR 21 tyres. While the all-new Bentley Mulsanne pays respect to the past, it is a thoroughly modern luxury car that offers the world’s most exclusive driving experience – a unique fusion of power, refinement and elegance.